Richard E. LaBelle a lifelong area resident passed away early Monday, March 13th, 2017, at the Northwestern Medical Center with his loving family at his side. Born in Richford on July 16th, 1935, he was the son of the late Guy and Priscilla (Broe) LaBelle. Richard was 81 years old. 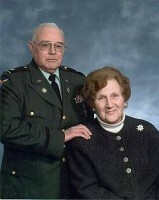 Richard was educated in Richford, he joined the US Air Force during the Korean War in 1952 at the age of 17. After his training, he volunteered for duty in Korea, but was sent to Germany during the occupation. He received an Honorable Discharge in 1961 after 9 years of service to his country. He received several medals including The National Defense Service Medal and the European Occupation Medal. He also served in the Vermont National Guard for two years. After retiring from the US Customs Service, he joined the Vermont State Guard in 2003 and served until his illness. He gave 100’s of hours during the deployments of the Vermont National Guard overseas. He transferred to the Air Wing section of the State Guard and continued to serve whenever needed. This service was all volunteer. He obtained the rank of Full Bird Colonel and received two Vermont Commendation Medals for his distinguished service to the State of Vermont. He always looked forward to spending time at the Samson Airforce Base in Waterloo, New York, where he started his Air Force career and then continued to serve as a trustee. He was very dedicated to his military background. He loved working and being around people and then finally he retired in January at the age of 81. Richard was a longtime member of Green Mountain Post # 1, American Legion, Robert E. Glidden Post # 758, Veterans of Foreign Wars and also the Vermont Guard. Once he retired from Immigration, he became a business owner. He then moved onto Shipping & Receiving for Kenyons Trucking and then became a Wholesale Distributor of IFG. He enjoyed spending time with his brother, Lomby and reminiscing about the good old days. He loved going to family functions and spending time with his family and grandchildren. Survivors include his wife of 62 years, Eva (Scheid) LaBelle; their children, Rick LaBelle and his wife, Linda, of Bakersfield, Ralf P. LaBelle and his partner, Ken Schlegel, of Johnson, Ronald B. LaBelle and his girlfriend, Debbie Chagnon, of Cambridge, Elizabeth Morris and her friend, Robin, of Fairfield and Nicholle J. Tinker and her husband, Charles, of Fletcher, as well as his grandchildren, Shawn LaBelle and his fiancé, Nicole Paradee, Justin LaBelle , Myra Stanhope and her husband, Chris, Andrew Morris and his fiancé, Hannah Hartman, Heidi Morris and her fiancée, Chad Mudgett, Ashlee Morris, Charles Tinker and fiancé, Dakota Siple, and Savannah Tinker and her boyfriend, Josh Wells, and his great-grandchildren, Lexie, Kaylah and Lorelie. Richard is also survived by his siblings, Lomby LaBelle and his wife, Thilbe, Jeannette Nichols and her husband, Peter, Lillian Beyor, Coleman Ward, Homer Ward, Robert Ward and Priscilla Ward. He was pre-deceased by his brothers, Ralph A. LaBelle and Jimmy Jackson. At his request, services will be private at the Heald Funeral Home. Interment with military honors will take place later this spring in the Greenwood Cemetery. Those planning an expression of sympathy are asked to consider, the Vermont National Guard Charitable Foundation, c/o Mr. Richard Brehm, 789 Vermont National Guard Road, Colchester, Vermont 05446 or Trinity Presbyterian Church, P.O. Box 422, St. Albans, Vermont 05478. To send Richard’s family a written expression of sympathy, please go to his on-line guest book at www.healdfuneralhome.com.